The Kick Off franchise is a series of football simulation computer games, In 1988 Dino Dini was hired to code a top down football game from a Steve Screech idea. in 1989 Kick Off was then published by Anil Gupta's publishing house Anco for the Atari ST and Commodore Amiga. The original version was programmed by Dino Dini with graphics, playtesting and tuning by Steve Screech. First released in 1989, Kick Off was received well by the games industry at the time and won awards. After the release of Kick Off several sequels were released. Player Manager was released in 1990. The game was the first game to combine a management environment (including tactics, league play, transfers, and detailed player attributes) with a football game engine (based on that of Kick Off). Kick Off 2 was released in 1990 as a sequel to Kick Off. The game introduced a number of new features as well as several small alterations. In 1992, Dino Dini left Anco and signed a contract for Virgin Games, which released Goal! in 1993. Anco released several further editions of the Kick Off series between 1994 and 1997, but these games had little in common with Kick Off and Kick Off 2. In 2001–2003, the KOA collaborated closely with Anco developer Steve Screech in an attempt to relaunch the Kick Off and Player Manager series. Kick Off 2002 was released. Anco started to work on another sequel Kick Off 2004 which reached beta status. The attempt came to a halt when Anco closed in 2003. Kick Off was released in 1989. Kick Off was first developed for the Atari ST and then ported to the Amiga. Several expansion disks were released for Kick Off 2. In 1992, Dino Dini left Anco and signed a contract for Virgin Games, which released Goal! in 1993. Anco released Kick Off 3 in 1994. The game used a side view instead of a top-down view and bore little resemblance to Kick Off 2 apart from the name. Anco Software published the first versions of Kick Off for the Amiga and Atari ST.
With Kick Off the ball did not stick to the player's feet but instead was realistically kicked ahead from the players, in a manner similar to that of Nintendo's Soccer, released in 1985 on the NES. This added a degree of difficulty and skill requirement at the same time. Other attributes, such as action replays, players with different characteristics, different tactics, fouls, yellow cards, red cards, injuries, injury time and various referees with different moods also featured. ST Action – Highest accolade they could give. PCW - "Nothing short of brilliant"
New Comp Express – "Computer football event of the year"
Awarded 1989 EMAP Images Golden Joystick Award Best 16 Bit Product. (EMAP is a major UK magazine publisher). Voted the 7th best game of all time in Amiga Power. In 1990, Kick Off 2 was released by Anco. Kick Off 2 retains the pace and accuracy of Kick Off, with a full size multi directional scrolling pitch and the players, markings, goals etc., in correct proportions. Both teams play the game strictly according to tactics. Players move into position to receive passes and gain possession. The ball, as in real game, travels ahead of the player. There is a league and a cup tournament with sudden death penalty shoot outs, in case of a draw. The teams in the league are on the whole evenly matched but with different styles of play and the player skills to match, that style. There is an option to load your own team from "Player Manager" along with your own tactics, to play against another "Player Manager" team in a single game or enter league and cup tournament. The special events selection in the main menu allows data disks to be loaded. Kick Off 2 also provides the facility to change strip colours and on expanded Atari ST's (1 MB or above) there are additional sound effects. The "Action Replay" facility allows goals to be viewed at normal pace or in "Slow Motion" and saved to disk. There are 24 referees and have their own distinctive temperaments. Super Kick Off is one of the follow-ups of Kick Off and Kick Off 2 for Game Boy, Sega and SNES. Super Kick Off was slower than the original games. The Mega Drive version knocked PGA Tour Golf II from the top of the charts. MegaTech gave the game 94% and a Hyper Game Award, saying that the "feel and playability is unrivalled by any other footy game so far", but criticising the high price of £45. In 1992, a sequel, Kick Off 3, was in development. The game wasn't released in this form though, as Dino Dini left Anco in 1992 for Virgin Games, where he developed Goal!, released in 1993. Goal! featured similar gameplay to Kick Off 2 but also added one-touch passing as seen in Sensible Soccer, player acceleration, and more advanced menu systems and options. Goal! received generally good reviews but did not enjoy the same lasting popularity as Kick Off 2. In 1994, Anco released Kick Off 3 developed by Steve Screech, a totally new game with nothing in common with Kick Off 2. The game didn't receive as good reviews as its predecessors and didn't gain the same popularity. An Atari Jaguar port was in development but never released. In 1996, Toka Nono released Kick Off 96 for Amiga and Windows. The game received average reviews. In 1997, Kick Off 97 was released for Windows. The game received better reviews than Kick Off 96 but still didn't become popular. Later the same year, Anco released Kick Off 98 for the PC which received poor reviews. In 1998 Kick Off World was released for the original PlayStation, again developed by Toka and published by Funsoft. In 2001, Steve Screech started a project called Ultimate Kick Off with the help of an early established Kick Off Association. The game was released by Anco in 2002 for PC and Mac with the name Kick Off 2002. The game received poor reviews and only sold 5000 copies. Later a sequel called Kick Off 2004 was planned. It reached beta status but it was never released. The project ended when Anco closed in 2003. In the end of 2015, Dino Dini announced that he was working on a new entry in the series, with a control system designed for the use with an analog stick. Kick Off Revival was released on June 24, 2016 exclusively for PlayStation 4 with poor reviews from the main game websites, Metacritic then elected Dino Dini Kick Off Revival the 2nd worst game of 2016. and Vice called Kick Off Revival the worst football game ever made. A delayed PlayStation Vita version was released nine months later in 2017 with bad reviews. A Steam version is in closed alpha, and invites are obtainable via Dini's Twitch channel. In 2016 was announced AfterTouch Soccer, an enhanced remake of Kick Off 2 produced by Kick Off World, the international group maintaining the legacy of the original Kick Off games. Developed with the help from the original author Steve Screech that gave permission to use all his graphics from Kick Off 2, it is intended as a sequel more adherent to the gameplay on the Commodore Amiga, and it has been published by itch.io in early 2017 on smartphones and personal computers. ^ "Steve Screech Video Game Credits and Biography - MobyGames". MobyGames. Archived from the original on 2017-10-29. Retrieved 2017-11-09. ^ "Kick Off for Amiga (1989)". MobyGames. Archived from the original on 2016-04-13. Retrieved 2016-10-17. ^ "Kick Off 2 for Amiga (1990)". MobyGames. Archived from the original on 2016-04-13. Retrieved 2016-10-17. ^ a b "Super Kick Off for Game Boy (1991)". MobyGames. 2007-11-23. Archived from the original on 2016-10-19. Retrieved 2016-10-17. ^ "Kick Off 3 for Amiga (1994)". MobyGames. Archived from the original on 2016-10-19. Retrieved 2016-10-17. ^ "Next Month - It's Kick Off 3!". Computer and Video Games. No. 148. Future Publishing. March 1994. p. 114. Archived from the original on 2018-09-12. Retrieved 2019-01-05. ^ "Work In Progress - Kick Off 3". Computer and Video Games. No. 149. Future Publishing. April 1994. pp. 22–24. Archived from the original on 2018-09-18. Retrieved 2019-01-05. ^ "Stop Info - Grand foot-oire de printemps sur consoles! - Kick Off 3". Player One (in French). No. 41. Média Système Édition. April 1994. p. 14. ^ Rand, Paul (May 1994). 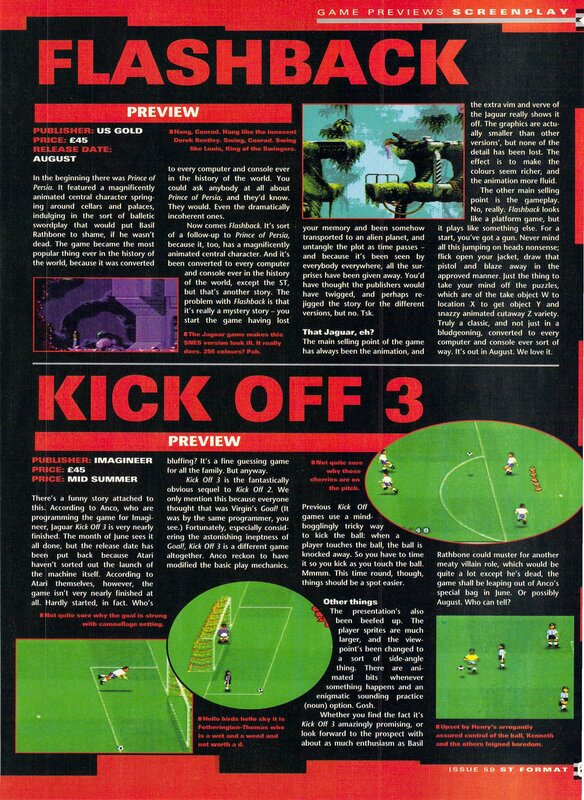 "CVG Review - Kick Off 3 (SNES)". Computer and Video Games. No. 150. Future Publishing. pp. 68–69. Archived from the original on 2018-09-12. Retrieved 2019-01-05. ^ Skews, Rik (June 1994). "CVG Review - Kick Off 3 (Mega Drive)". Computer and Video Games. No. 151. Future Publishing. p. 59. Archived from the original on 2018-09-12. Retrieved 2019-01-05. ^ "Kick Off 3 - A Whole New Ball Game". Electronic Gaming Monthly. No. 59. EGM Media, LLC. June 1994. p. 125. ^ "Special - Release Schedule ECTS-Messe". Mega Fun (in German). No. 21. CT Computec Verlag GmbH & Co. KG. June 1994. p. 16. Archived from the original on 2018-09-12. Retrieved 2018-09-11. ^ "Screenplay - Game Previews - Kick Off 3". ST Format. No. 59. Future plc. June 1994. p. 61. Archived from the original on 2018-09-27. Retrieved 2018-09-11. ^ "Jaguar - Una máquina felina para un mercado voraz - Compañías y juegos". Hobby Consolas (in Spanish). No. 41. Axel Springer SE. February 1995. p. 27. ^ "Kick Off 96 for Amiga (1996)". MobyGames. 2001-08-13. Archived from the original on 2016-06-19. Retrieved 2016-10-17. ^ "Kick Off 97 for DOS (1997)". MobyGames. Archived from the original on 2016-05-12. Retrieved 2016-10-17. ^ "Kick Off 98 for DOS (1997)". MobyGames. Archived from the original on 2016-04-10. Retrieved 2016-10-17. ^ "Games - Articles - Kick Off 2002". Apple. 1999-04-05. Archived from the original on 2009-02-06. Retrieved 2009-03-09. ^ "Kick Off 2002 for Macintosh (2002)". MobyGames. Archived from the original on 2016-10-19. Retrieved 2016-10-17. ^ Roberts, David (2014-09-11). "GamesRadar". Computerandvideogames.com. Archived from the original on 2009-03-15. Retrieved 2016-10-17. ^ a b "GameFAQs". Archived from the original on 2017-04-21. Retrieved 2017-04-20. ^ "Dino Dini Kick Off Revival PS Vita reviews". Metacritic. Archived from the original on 2017-09-15. Retrieved 7 September 2017. ^ "AfterTouch Soccer, il kick off spiritual sequel available on PC and mobile". The Games Machine=2017-03-22. Archived from the original on 2017-08-31. Retrieved 2017-05-08. ^ "AfterTouch Soccer (aka Kick Off 2016)". Touch Arcade=2016-06-13. Archived from the original on 2017-04-15. Retrieved 2017-05-08. ^ "AfterTouch Soccer First impressions". il videogioco=2017-02-12. Archived from the original on 2017-06-09. Retrieved 2017-05-08. ^ "Kick Off World". itch=2017-03-13. Archived from the original on 2017-03-30. Retrieved 2017-05-08. ^ "AfterTouch Soccer". itch.io=2017-03-15. Archived from the original on 2017-05-03. Retrieved 2017-05-08. ^ "The AfterTouch Soccer final version (the Kick Off 2 reboot-remake) is available on PC and smartphone". Il videogioco=2017-03-09. Archived from the original on 2017-03-09. Retrieved 2017-05-08. ^ "Game Group Rap Sheet". MobyGames. Archived from the original on 2016-10-19. Retrieved 2016-10-17. ^ "After Touch Soccer - A Kick Off fan remake (2017)". indieretronews. Retrieved 2017-05-08. ^ "After Touch Soccer, PC review". Il videogioco. Archived from the original on 2017-03-20. Retrieved 2017-05-08. This page was last edited on 9 March 2019, at 21:06 (UTC).